The SG300-52P 50-Port 10/100/1000 Gigabit Managed PoE+ Switch from Cisco provides a reliable foundation for your business network. It delivers the features you need to improve the availability of your critical business applications, protect sensitive data and optimize network bandwidth to deliver information and applications more effectively. Setting up and the usage of the Cisco SG300-52P is a breeze and it provides the ideal combination of affordability and capabilities for small businesses and helps you create a more efficient, better-connected workforce. The Cisco SG300-52P has the advanced security management capabilities and network features you need to support business-class data, voice, security and wireless technologies. At the same time, it is simple to deploy and configure, allowing you to take advantage of the managed network service your business requires. 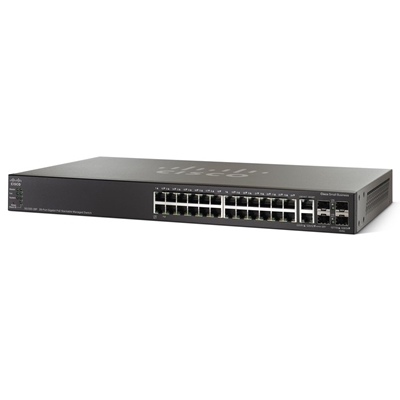 The Cisco SG300-52P switch can simply and securely connect employees working in small offices with each other and with all of the servers, printers and other devices they use. High performance and reliable connectivity helps speed file transfers and data processing, improves network uptime and keeps your employees connected and productive. The SG300-52P features 48 PoE ports of Gigabit Ethernet connectivity. This capability simplifies advanced technology deployments such as IP telephony, wireless, and IP surveillance by allowing you to connect and power network endpoints over a single Ethernet cable. With no need to install separate power supplies for IP phones or wireless access points, you can take advantage of advanced communications technologies more quickly, and at a lower cost. Some models support both IEEE 802.3af PoE and IEEE 802.3at PoE+ while others support IEEE 802.3af PoE only. The Cisco SG300-52P switch allows employees to work productively from conference rooms and common areas, collaborate in any office and access business applications from wherever they are. Gigabit Ethernet connectivity helps ensure that your employees have the bandwidth and performance they need to make the most of mobile productivity. And with embedded security, your employees can work with confidence, knowing that only authorized users can access applications and network devices. As a managed network solution, the Cisco SG300-52P switch provides the performance and advanced traffic-handling intelligence you need to deliver all communications and data over a single network. The Cisco SG300-52P is rigorously tested to help ensure easy integration and full compatibility with Cisco and other products, providing a complete small business solution. The Cisco SG300-52P switch lets you extend highly secure network connectivity to guests in a variety of settings, such as a hotel, an office waiting room or any other area open to nonemployee users. Using powerful but easy-to-configure security and traffic segmentation capabilities, you can isolate your vital business traffic from guest services and keep guests' network sessions private from each other. The Cisco SG300-52P switch is rigorously tested to deliver the high availability and performance you expect from a Cisco switch. The solution speeds up file transfer times and improves slow, sluggish networks, while keeping your vital business applications available and preventing costly downtime. As a managed switching solution, the Cisco SG300-52P also gives you the flexibility to manage and prioritize high-bandwidth traffic such as voice. That means you can empower your employees with state-of-the-art communication and productivity solutions, without draining the performance of your other business applications. The Cisco SG300-52P switch is designed to be easy to use and managed by small businesses and the partners who serve them. The included device manager software provides an intuitive, web-based interface to simplify setup, security and quality of service (QoS) traffic prioritization, allowing even users without IT expertise to configure the switch in minutes. It also provides a Cisco FindIT Network Discovery Utility. This utility works through a simple toolbar on the user's web browser to discover Cisco devices in the network and display basic information, such as serial numbers and IP addresses, to aid in the configuration and deployment of Cisco Small Business products. The Cisco SG300-52P switch uses Cisco Discovery Protocol as well as Link Layer Discovery Protocol (LLDP-MED) to automatically detect all the devices connected to your network and then automatically configures them for the appropriate connectivity and instructs the devices to use appropriate voice VLAN or QoS parameters. For more advanced capabilities and hands-on control, the switch supports Smartport roles which configure the ports with specific levels of Security, QoS and availability according to the type of connected device, based on Cisco best practices and pretested configurations. The Auto Smartports feature applies the intelligence delivered through the Smartport roles and applies it automatically to the port based on the devices discovered over CDP or LLDP-MED. This facilitates zero touch deployments. Although the Cisco SG300-52P is designed to be deployed without using a command-line interface, Cisco Textview is available for those who prefer to use text-based configuration. Together, these features reduce the time your staff must devote to network deployment, management and troubleshooting. • Embedded security to protect management data traveling to and from the switch and encrypt network communications. • Extensive access control lists to restrict sensitive portions of the network from unauthorized users and guard against network attacks. • Guest virtual LANs to let you provide Internet connectivity to nonemployee users while isolating critical business services from guest traffic. • Support for advanced network security applications such as IEEE 802.1X port security to tightly limit access to specific segments of your network. • Security mechanisms such as, Bridge Protocol Data Unit Guard and broadcast/multicast/unknown unicast storm control, protect the network from invalid configurations or malicious intent. • Secure Core Technology helps ensure that the switch will receive and process management and protocol traffic no matter how much traffic is received. The Cisco SG300-52P switch includes embedded QoS intelligence to prioritize delay-sensitive services such as voice and video, simplify unified communications deployments and help ensure consistent network performance for all services. For example, automated voice VLAN capabilities let you plug any IP phone (including third-party phones) into your IP telephony network and receive an immediate dial tone. The switch automatically configures the device with the right VLAN and QoS parameters to prioritize voice traffic. • Static routing/Layer 3 switching between VLANs: This capability allows you to segment your network into separate workgroups and communicate across VLANs without degrading application performance. As a result, you can manage internal routing with your switch and dedicate your router to external traffic and security, helping your network runs more efficiently. • IPv6 support: As the IP network addressing scheme evolves to accommodate more devices, you can make sure that your network is ready. The Cisco SG300-52P switch provides native support for IPv6, the newest version of the Internet Protocol, as well as the previous IPv4 standard. As a result, you will be able to move up to the next generation of networking applications and operating systems without an extensive equipment upgrade. • Dual image support: With the ability to maintain dual images of your switches, you can perform software upgrades without having to take the network offline and without worrying about an outage during an upgrade. • Remote management: Using Simple Network Management Protocol, you can set up and manage all switches and other Cisco devices in your network remotely, instead of having to directly connect to them. • The latest application-specific integrated circuits, using low-power 65-nanometer technology (these chipsets allow for lower power consumption and thinner, more efficient designs). • Embedded intelligence to adjust signal strength based on cable length. 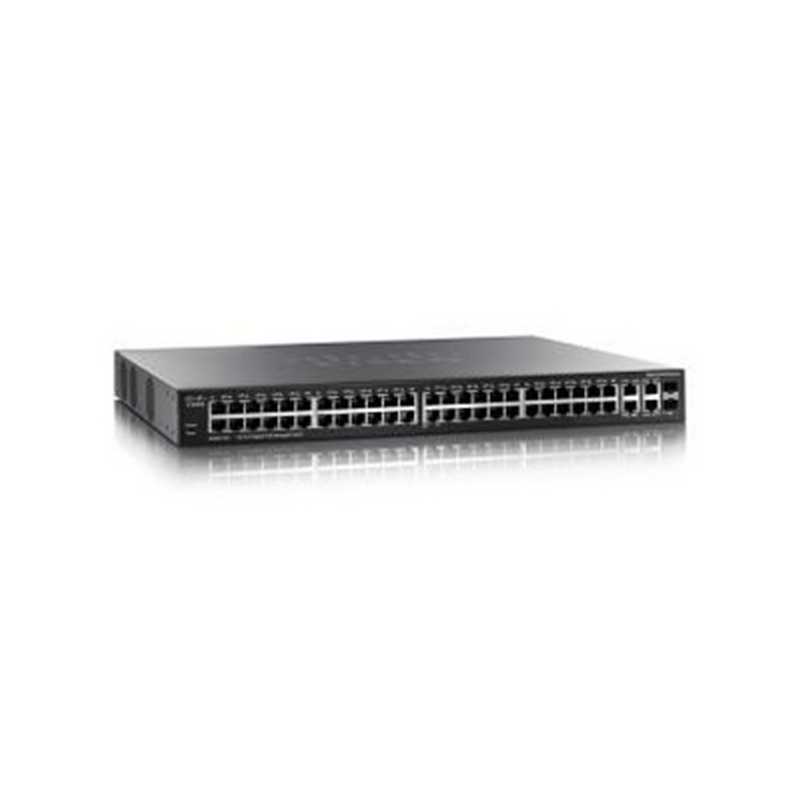 The Cisco SG300-52P switch provides more ports per Gigabit Ethernet switch than traditional switch models, giving you more flexibility to connect and empower your business. It also offers mini gigabit interface converter (mini-GBIC) expansion slots that give you the option to add fiber-optic or Gigabit Ethernet uplink connectivity to the switch. With the ability to increase the connectivity range of the switch, you have more flexibility to design your network around your unique business environment and to easily connect switch on different floors or across the business. 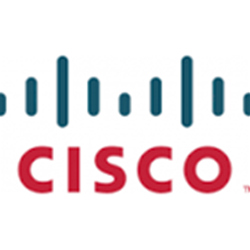 • Cisco Small Business Investment Protection program, which lets you upgrade your Cisco SG300-52P switch to another Cisco Small Business or Cisco Catalyst switch in the future and receive credit for the value of the switch (available only in the United States and Canada).